You don’t want to be watching sad things but happy shows. Honestly wasn’t going to do another watch-along recommendation as the last two years I’ve done posts on that but.. heck let’s do another one. This might the last time doing this but your welcome to check out my 2015 and last years suggestions. Christmas time is a time, I’d rather watch all the happy series but if watching such series as bloody Tokyo Ghoul make you happy. Well be my guest. My selection for my top 5 series aren’t ones I’ve watched over Christmas. Because I remember have put a smile on my face and make me laugh to no end. Remember these are my personal picks and if you happen to try out one. Then I’ll be so happy won’t lie. Was only this year I watched cute, comedic Acchi Kochi with a close friend who recommended it. We watched the whole thing together and it was a great time. The anime centres on Tsumiki where professing her love to her best friend Io is not the simplest thing. Following the daily, crazy antics of Tsumiki and her friends. This series is indeed a cute watch that will make you smile. Indeed have a soft spot for Tsumiki as after her failing attempts to let her feelings be known. Tsumiki has her dramatic moments of those who get close to Io. Which always came out of nowhere, hilarious. It’s pretty senseless most of the crazy situations that occur in the series. Guarantee though will make for a great comedic watch, this Christmas. Ever heard of a vampire being a un-vampire? Karin is not like your average blood sucker, she gets nosebleeds? Having a rare disorder where she builds up so much excess blood and results in nose bleeds. By releasing that stress on strangers whom become unusually happy afterwards, enter Kenta Usui. Who’s appearance has Karin’s nose bleed happening on the reoccurrence more. This is one of my favourite cute series, just loved loosing myself and having fun with. It’s definitely unlike other vampire series like Hellsing or Vampire Hunter D, less gore more cute. Romance fans I have you covered for that part as the growing affections between Usi and Karin is pretty adorable. Karin’s quirky family are something you’ll be laughing at, particularly if you watch the dub. The extends Karin’s will go to protect her own are warming but hard to take seriously at points. Not saying that is a bad thing just whenever something serious is about to occur, is hard to take seriously. Usually I end up bursting out laughing, so that’s a good sign yeh? 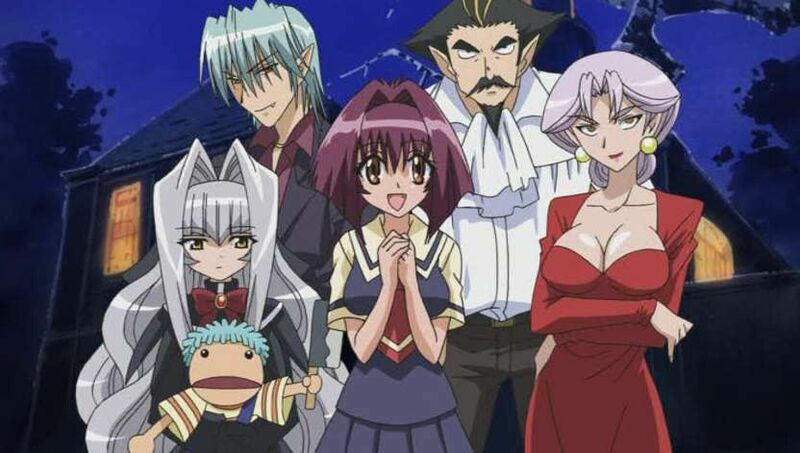 Chibi Vampire has you covered this Christmas for something cute to watch and romance people. It does have an adorable Christmas episode. If there was a series could I not recommend anymore out of this list, it would be Full Metal Panic Fumoffu. To this date it is still my favourite comedy ever, I’ve lost count how many times in re-watching the series. Fumoffu is the second season to Full Metal Panic centring on Military solider Sousuke Sagara who is tasked to guard high schooler Kaname chidori. Second season Fumoffu focuses on school life for Kaname and Sousuke. Not like in season one centring on Sousuke’s miltary background. Fumoffu is an outrageous, crazy time watching Sousuke learn how to integrate into society. His thinking solving everything with military means will be the fix. Always stirring up the pot and stressing out Kaname at the same time. I do so wish this series was longer, after watching it you’ll just crave more. You’ll have a great time with Fumoffu and laughing so hard till you cry possibly. That’s how it is for me every time re-watching. Ask yourself what would be common way to respond to a love letter? Read it but what do you think Sousuke does? Give the first episode a go to find out and recommend the english dub. You’ll thank me later. This was is aimed towards those who are not a fan of the mecha genre. Who hasn’t heard of Gurren Lagann by now? One of the most loved mecha series to date. Young digger Simon lives in a underground village, has never seen up above. Simon’s spent most of his life just digging with no real purpose. Till he encounters Kamina, and the two discover a ancient mecha. Which Simon accidentally activates sending the two to the surface. Where Simon’s life is changed forever. Gurren Lagann main focus is the main group of Simon, Kamina and later on Yoko. The mecha element to Gurren is half apart of the plot. But all the mecha battles are over the top and silly which makes for a entertaining time. That’s also the great thing about Gurren Lagann how silly and over the top it is. But it’s the reason why so many people and myself love it so much. It’s about having belief in yourself shown in the most extravagant way. 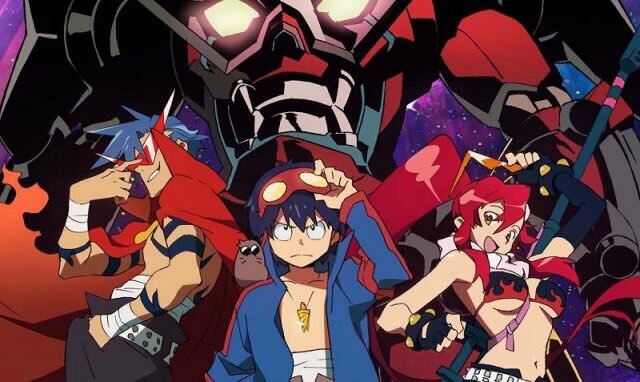 If you have not tried Gurren Lagann it could be your most entertaining watch this Christmas. You guys can trust me on this one and for those that have never tried a mecha show before. Another favourite comedy coming through.Makes me wonder to this day why this series is name after snow white and the seven dwarfs. It has no relation with this what so ever. Okami – san like Full Metal Panic is another comedy that knows how win me over with laughter. I’ve reviewed this series before but that review is not very good, back when first starting out blogging. Okami – san centres on a group called the ‘Otogi Bank’ where they fulfill the request of students favours. In return they must repay the favour. Taking the main focus on Tomboy Ryouko, who is stunned by newest recruit Ryoushi. Confessing his love for her and seeing during the series trying to win over Ryouko. All the characters in Okami – San are a ranged, quirky lot and make all the situations they get into. Very funny and hilarious to watch. It’s similar to Acchi Kochi but I would pick this series over that. One thing about Okami – san that surprised me was the narrator who pops in every now and again. Actually thought would be annoying but actually comes in at the right moment, elevating comedic factor. Hope you enjoyed my piece on Personal Xmas Recommendations for day 5, 12 days of anime. If you want to follow all the other bloggers participating in this click here for the spread sheet. Also can use the hash tag on #12DaysOfAnime on here and through twitter to find more posts.